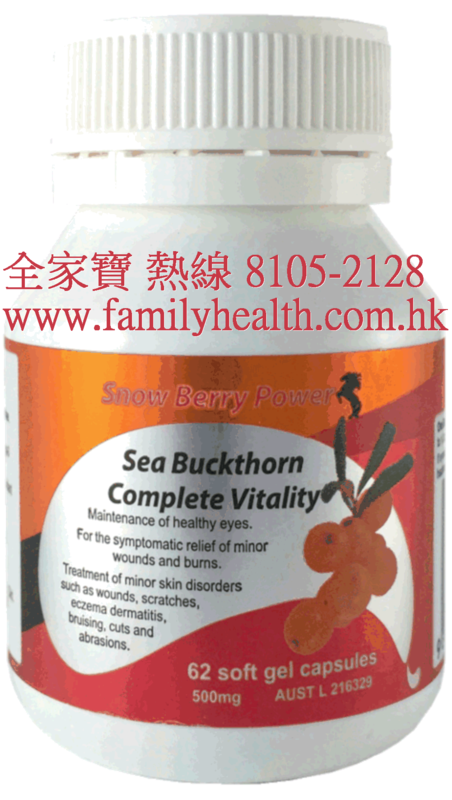 Sea Buckthorn Complete Vitality is an Australian compliant product so you can be reassured of its quality. Delivery via a soft gel capsule is a quick and convenient way of adding this well-respected supplement to your daily health regime. We have used the oil from both the berry and the seed to supply a superb combination of what this little berry can offer. The Sea Buckthorn (Hippophae rhamnoides) Berry has traditionally been used in Asian traditional systems of medicine (Tibetan, Mongolian, Chinese) to the support and maintenance of healthy skin and mucous membrane (Hippophae rhamnoides means "shiny horse" - the plant was fed to horses in Ancient Greece where it was found to improve their health and impart a gloss to their coat). Traditional medicinal uses of Sea Buckthorn are well documented in Asia, Europe and Scandinavia over thousands of years. Sea Buckthorn Berries and Seeds are a natural source of fatty acids, including Omega-7 (palmitoleic acid), Omega-7 (linoleic acid), Omega-3 (alpha-linolenic acid), Omega-5 (myristoleic acid) and Omega-9 (oleic acid), natural carotenoids and Vitamin E, amino acids and trace elements. 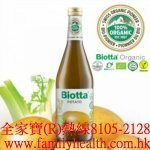 Our pure product (Sea Buckthorn Berry and Seed Oil) is a natural source of antioxidant compounds including tocopherols, carotenoids and Vitamin C.
Some of the most important pharmacological functions of Sea Buckthorn Oil are its anti-inflammatory, anti-microbial, pain relief and promotion and regeneration of tissue attributes. 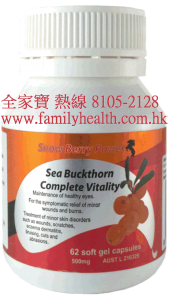 Numerous clinical studies with Sea Buckthorn Oil support its efficacy in the maintenance of healthy eyes, providing relief from superficial dry eye problems. It helps to soothe the redness and inflammation of the skin, supports a healthy circulatory system and may be beneficial for cardiac function and vascular elasticity. This container of 62 capsules should be taken as 2-3 capsules daily reducing to 1-2 capsules daily for maintenance.